Hello. Welcome to a day in the life of a Native English Teacher in Hong Kong. Yup, that’s me, Teacher Claire! Lord. How did I ever become a teacher? Bless my little Year 8 self when my English Teacher asked me what I wanted to be when I was older. I completely made up the fact that I wanted to be an English Teacher in hope that he would like me and y’know, maybe give me an extra A here and there. Lolz. WELL LOOK AT ME NOW. Fake it ‘til you make it sistah. My fake dream came a reality and honestly? I’m kinda liking it. A lot of people have asked me what I do on a daily basis so I thought I’d write a blog post telling you exactly that! 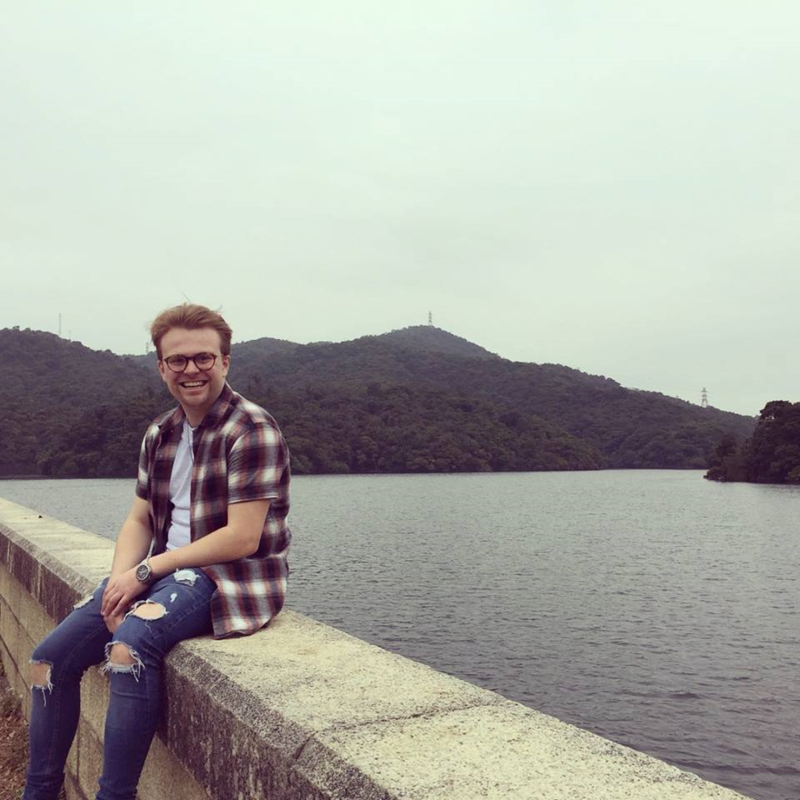 It’s Friday the day I’m writing this so I’m going to write about my Friday schedule to give you a general idea about what teaching in Hong Kong is like. snooze my alarm, and then snooze it again. Wake up to my third alarm of the morning and groan because GOD DAMMIT WHY DO I ALWAYS WAKE UP SO LATE?! I grab my outfit that I usually lay out the night before, brush my teeth and throw my hair into the messiest pony tail you ever did see. Drink some water, run around like a headless chicken grabbing my purse and belongings and then dash out the door. PRETTTYYYY standard, huh. Leave my tiny studio apartment and walk to work. It takes me around 20 minutes of a normal paced walk to get to work and I actually like being able to walk! Commuting is something I hate so getting a bit of fresh air on my journey is a huge plus. Especially when it’s sunny! Yay. Arrive at work and welcome the kids in. I have my first lesson of the day. Lessons are an hour long and they cover a range of things such as phonics, spelling, reading, oral English speaking and creative writing. I have another lesson straight after. Honestly, the kids make me laugh so much man. My morning lessons are over. I have an hour free to do admin work (and also catch up with Emily (the other teacher) about life and Netflix.) COMPLETE WORK GOALS, I know. LUNCH TIME. Yes bebeh. I usually go to 7/11 to grab some noodles and a Red Bull but recently I’ve been bringing in my own salads or cous cous because I’m a trier. Also Luke works next door to me so sometimes we go and grab lunch together at a restaurant overlooking the harbour. Cute work perks. Another hour of admin time! All our lesson plans and worksheets are already created for us. We just have to print and organize them so they’re ready for class. My third lesson of the day! I have a couple of hours to get more things done such as update parents or write reports etc! All the stuff I won’t bore you with. My last lesson of the day! HOME TIME. I quickly pack away and walk home. I’m usually in a good mood on Fridays because it’s one of my favourite days. I get home at around 7 ish and usually Luke has already started cooking dinner. Cutie. Sometimes I stop off at the gym on the way home, sometimes not. Usually the latter. Judge me. I work 5 days a week (including Saturday) so my days off are Thursday’s and Sundays. It’s really good to have a day in the middle of the week to break it up a little. Teaching in Hong Kong can be really fun but it’s also super tiring. The lifestyle in Hong Kong is just amazing and being able to find a job in a fun environment just makes it all that more worthwhile. Let me know if you have any questions about teaching abroad and I’d be happy to answer them! You can follow Teacher Claire and her journey on her Instagram here @grabyourcam. Also check out her regular blogs on her website here www.grabyourcamera.co.uk She gives lots of insight into life in Hong Kong! “I have lived here for 12 months and have have already been to 4 other countries. Back in the UK I would be slumming it 9-5, Monday – Friday for that week’s holiday to Ibiza or Benidorm!” – Jack Tucknott. Hello, and a big welcome to our brand new #Ask-An-Expat blog series! If you haven’t already guessed from the oh-so self explanatory title, we will be asking a bunch of our wonderful expat teachers what life is really like in Hong Kong. We will be interviewing people from different backgrounds all over the world that have found themselves teaching in this vibrant and lively city, and ask them how they managed setting up their new lives here. Hong Kong is one of the most popular expat cities in the world, and we are hosting this series to show you exactly why that might be! With a bustling city boasting incredible skylines and is known for the “city that has everything”… there is no wonder that people across the globe are wanting to get in on the action and see the beauty for themselves! 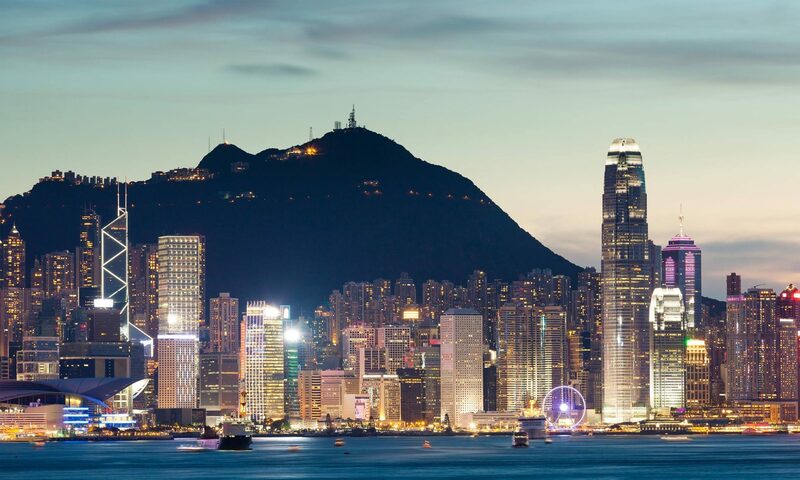 Fun fact of the day: Hong Kong has the most skyscrapers in the world; double that of its closest rival: New York City. 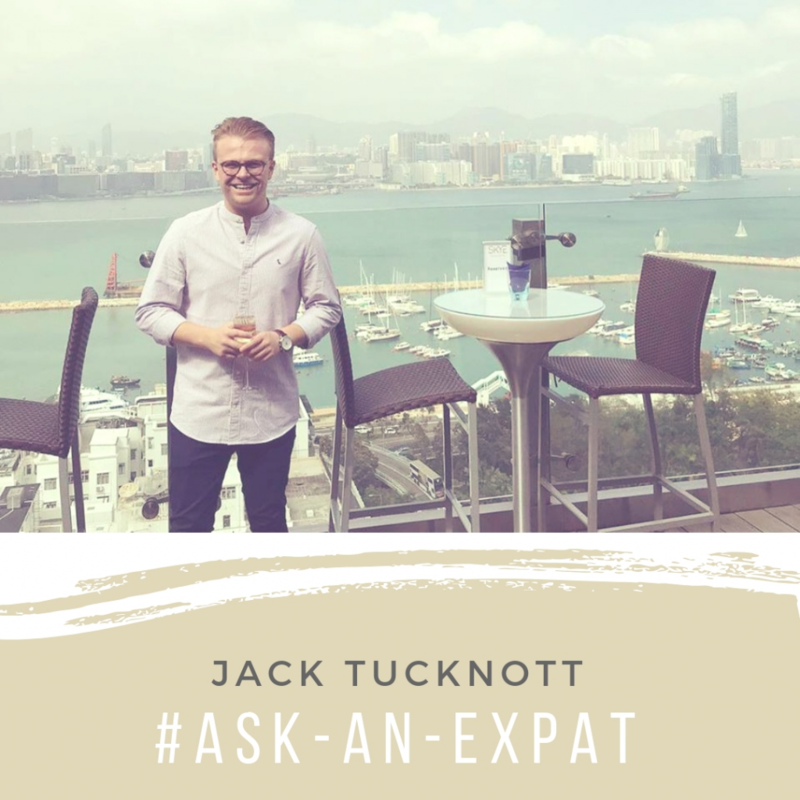 We are kicking off this exciting #Ask-An-Expat series with a nitty and gritty interview with one of our very own teachers, Jack Tucknott! 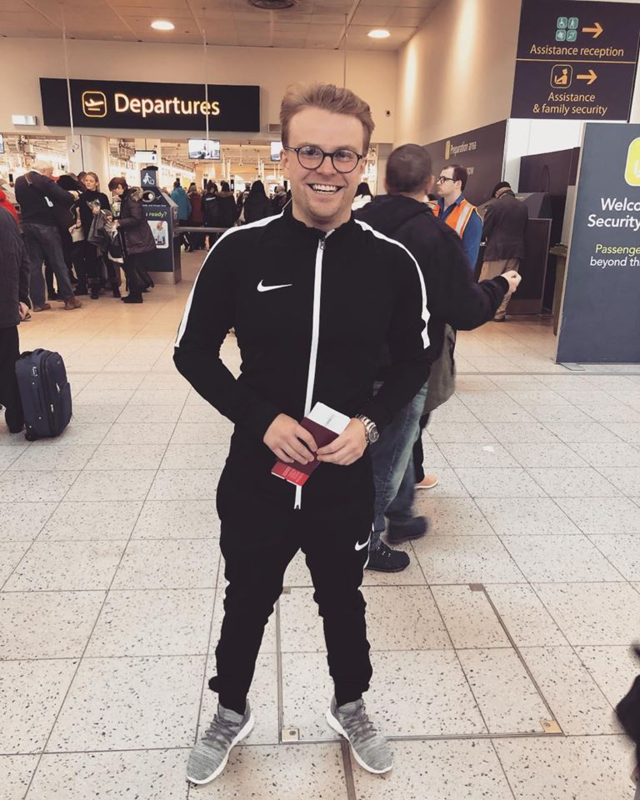 Before we dive straight in, here is a photo of Jack on the very day he was flying out to Hong Kong! Judging by the huge grin on his face, he was very excited! Anyway, let’s get on with interviewing Jack about his journey so far! I’m from Brighton, United Kingdom! I studied a Masters in Sports Psychology at Liverpool John Moores University. Prior to that I studied a BSc in Science & Football. This was also studied at Liverpool John Moores uni. Did you travel to Hong Kong alone or with someone else? I travelled alone but my friend from University was already working and living out here. I’ve always wanted to teach in some form, but I wanted to work in professional sport as a sport psychologist. Then teach about my experiences. But now I love teaching English so this is maybe another avenue I keep pursuing in the future! How did you find out about Experior? How did they help your big move across the world? My friend was already in the company and he referred me. They were great at sorting me a job and helping me get settled in from the start. I really appreciated that they picked me up from the airport and took me into my accommodation. Where abouts do you live in Hong Kong? What’s it like? I live in Tai Kok Tsui, Kowloon. It’s a great location in regards to the centre of Hong Kong, and it isn’t too far from my work place which is practically in Shenzhen! Have you learnt any Cantonese or Mandarin whilst you’ve been here? I actually know how to say “Speak English!” to my students, but I have no idea how to spell it! Have you joined any clubs or extra activities whilst being here in Hong Kong? I’ve been to a few salsa classes! I’m absolutely terrible but me and my friend found it hilarious and it’s good to try new things and push yourself out of your comfort zone. 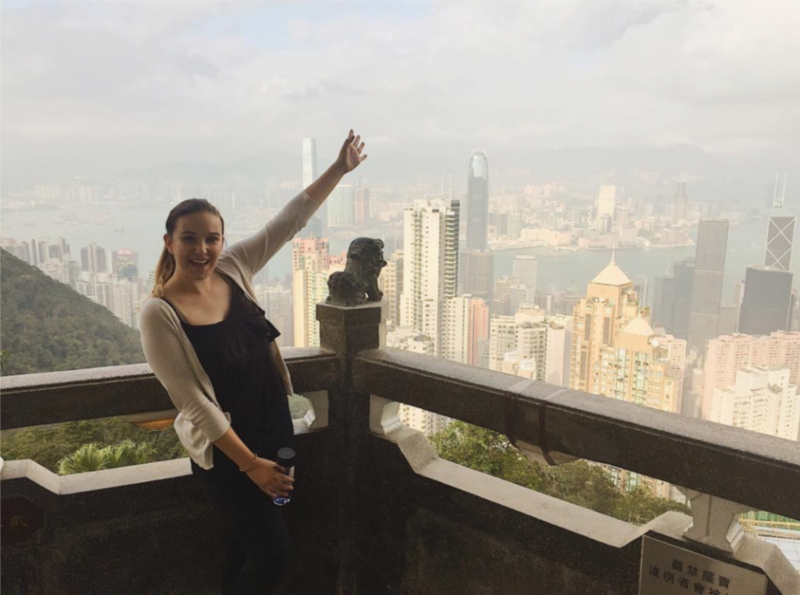 How did you find the culture difference when you came to Hong Kong? I love the culture difference! You can get all of the local traditions and cultures in Kowloon, but have your western fix on the Island side. It’s very easy to settle in to Hong Kong compared to other places in Asia. What’s the best thing you’ve experienced so far whilst working abroad? I am experiencing the definition of a working holiday. I love my job, my friends, and the opportunities I have made and found. I have lived here for 9 months and have have already been to 3 other countries. Back in the UK I would be slumming it 9-5, Monday – Friday for that week’s holiday to Ibiza or Benidorm! Living. It can be very stressful to get a flat and you’re paying over the odds for a box room. What’s the night life like in Hong Kong? It’s good but expensive! I like how you can drink on the streets and the rooftop bars are insane! Looking out to all the skyscrapers! But you need to take your wallet out! What was your transition from the UK to Hong Kong like? Were you nervous or excited? I couldn’t wait to get out here! I’ve always wanted to work and live abroad. I knew it would change my life for the better. What has been your favourite Experior event so far? Tell us about it! Probably a boozey brunch. You can never go wrong with great food and a free flow of drinks! 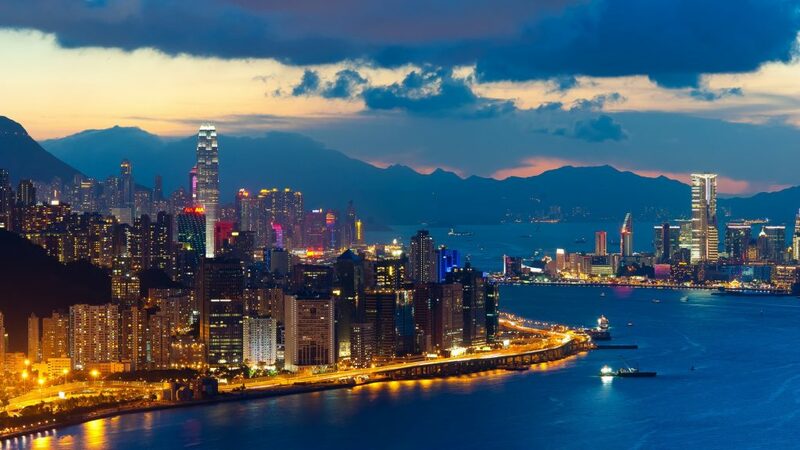 In ONE WORD, describe your Hong Kong experience! What a fantastic ending to a lovely interview with Teacher Jack. We are so glad that he is enjoying his rollercoaster of a journey out here in Hong Kong. He gave us a great taste as to what life is like in the #852! NEW TEACHING OPPORTUNITIES IN CHINA! At Experior Asia, we are delighted to announce we have brand new and amazing opportunities to teach in Shenzhen, China. Graduates, aspiring teachers or anyone who wants to explore a new part of the world, this is perfect for you! China is one of the biggest and fastest growing economies in the world. There’s no better place to grow an international CV you can be truly proud of. So what’s all the fuss about? One of the biggest surprises when visiting China is the country’s incredible diversity. As the third largest nation in the world, China occupies a vast expense of territory, making it home to a diverse range of terrain and weather to culture, language and food. The Chinese population is itself made up of 56 ethnic groups each with their own customs and traditions. All these fantastic aspects makes China a wonderful country to travel, live in and explore. With the country being as large and diverse as it is, there are limitless opportunities for teachers to inspire and make a real difference. With experience or not, you can make a positive impact on people’s lives whilst teaching in China. Lonely Planet recently named Shenzhen as one of the top cities in the world to visit in 2019, they describe it as the ‘Silicon Valley’of China. Situated in the Guangdong district of China, Shenzhen is on the southern border where China and Hong Kong meet. Thanks to its developed economy and the new high-speed rail, it’s super easy to travel to Hong Kong or take an exciting adventure across China. It is also one of China’s fastest growing cities with lots of investment and redevelopment in recent years. It’s a popular central hub with a good balance of western and local culture. With all this growth comes an ever growing expat community which means you’ll never be short of friends and new faces to meet. One of the best parts of teaching in China is the opportunities available for teachers with all levels of experience. Whether you’re a recent graduate in any major, or a qualified teacher with vast experience, we will have a role for you. Check out the information below for more job details. ● Working hours are 40 hours per week, may include Saturdays and Sundays. ● Professional training provided on Putonghua and LAMDA Examinations qualification and other teaching skills. ● Free accommodation provided in Shenzhen, with Wi-Fi, furniture etc. ● Travel allowances: RMB 4,000 reimbursement upon completion of 1 year service and extra of RMB 4,000 for return ticket if renewal for 2nd year employment contract. ● At least one to two years of teaching experience desired, (working experience can be waived if holder of degree in Education related field). SO WHERE WOULD YOU STAY? Here at Experior Asia we don’t just find you a job. We ensure you feel comfortable and happy in your new home. Accommodation can be difficult to find, so we go the extra mile and let you relax whilst we find it for you. If you read this post imagining yourself travelling the world, changing children’s lives or simply just want to add something exciting to your CV then click HERE to apply now! Keep an eye out for our future blog posts! We have lots more exciting content to come!